From your initial enquiry we will arrange a relaxed, no pressure appointment to discuss your requirements. we can also advise you of any appropriate current regulations and requirements, and any questions or queries that you may have can be answered. We will provide a full written quotation, sketches and information package. 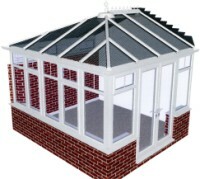 With conservatory quotations we supply a selection of CAD Colour drawings to enable you to see your potential conservatory from all viewing points. Upon receipt of your quotation you will receive no follow up sales calls.